The virtual eco village is almost ready and will go live next month. Members send in pics, words and videos of thier OWN projects for self sustainability,meditation and so on. A welcome Message fron Mudra! My idea was for stake holder members to pay a small annual fee and thus become an equal partner of a community. (I was up til last year going to be a member of a real community in England based loosley on this method). This way also shows intent on behalf of the member with the group aswell as individuals benefiting from the economy the community generates. perhaps we could make a regular donation each month to charity. option 2 is for a free one which means I pay everything and run it and anyone can join. it should be interesting and purposeful and fun with the hope it leads to something actual. Ok. Here is a better idea of what it will look like. It has a blog and a members chatroom too. Im working on a domain name and it wont be a free to make site but this will give you a better idea. If there is not much interest here im still going ahead with it outside of this forum so its up to you guys but you are most welcome. How did You want to co-operate with the New Portal going up for the MoA soon ? What can We do or facilitate for You that We're not already doing or facilitating ? The forums fine and im going to encourage people to join it and your portal. Im wanting to move away from forums and discussion into projects that will move away from the internet over time and assist those intending to form community. Their own or joining others. A network of perhaps. As I said, the reason I handed the Mists over to Carol is because I wanted to get away from the hassels of forum and get stuck into real projects. And this is it. I also think a totally clean break from Project Avalon and Camelot is required as they are very divisive at the moment even though much of the material there is useful. Im not expecting many to join as people generally talk more than they act. Its a different emphasis Merc but one I hope leads to people doing what they have been talking about for the last 3 or 4 years. And yes that includes me. Id be really pleased if you can link it to the portal but thats up to you guys. guys. For sure Bro. Send Us the Link of it or is the one above going to be the Final URL of what You'll go with on this Iniative ? 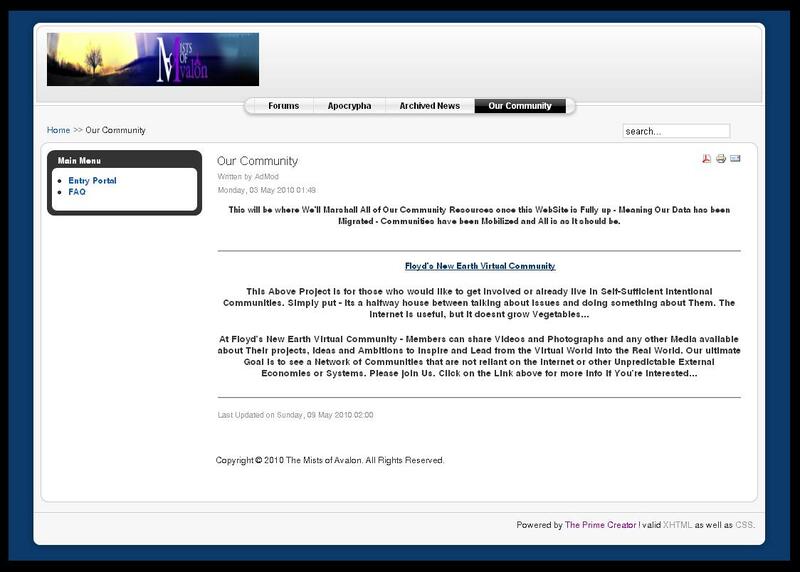 I'll put the Link to It on the "Our Community" Page. Thanks Merc. Ill send you the final link when its ready but you can use that one for now. Ive got a Mists banner up on the site and suggest people visit and join and ive got a link to the Mists up on the blog too. there wont be daily activity on the new site so if people need a daily fix the Mists is the place to be!!! If theres anything else I can do to help please just ask. I am very interested in joining in this Floyd. Raie wrote: I am very interested in joining in this Floyd. It is hoped to lead to start up projects. Beside community, there is no reason to stop people moving to the same town.village if they dont like the idea of living on top of one another in fact in many ways the latter is more appealing. Communities can often descend into nasty power struggles, and can be controlling and intrusive. That is the problem of heirarchy. There is no reason that attitude cannot be changed though. It would be good to see a network of communities around the world starting up would it not? The project starts next month. Hi Floyd! Thanks for your reply. This looks good to me. I am also not one for living on top of others and I have come too far in life to want to go through any of that, though I do not believe that isolation is the key to happiness. There are some great opportunities in life that are made for sharing. Just for example, I have some land available to me that I am not able to manage on my own. Due to the nature of the land and the setting it also requires some sensitivity. It is one thing being your own person but isolation can only bring you so far when you have a lot to give others. There can be great joy in a solitary life but there is also great joy to be found in connecting with others. The truths of nature are very simple really. If you provide the right environment things will thrive. Too often people live without their needs being met and it is unnecessary. It has always saddened me that on a planet with a population of over 6 billion, even one person should ever feel so lonely or unhappy that they would consider taking their own life. Being alive is like a miracle to me. Also, that anyone can starve to death or live under threat and abuse in a world where everything is available to us is mind boggling. Don’t give me Karma. The lesson the human race today has to learn is how to open up to their full potential, to stand in their own shoes but at the same time have the compassion to assist others when they need it. I don’t think you can open up to your own full potential without bringing others along with you. I think there is a very simple underlying process of connection going on here and this is how, hopefully, the human race will be lifted out of its misery. I know it doesn’t seem possible at times, but it very well may be. Thats great. maybe you can find someone to work with soon and explore possibilities in your locale. Im more or less ready to go and will be taking members soon and hopefully adding communites from the world over. please email me anyone if you would like to join in the fun. It wont be limited to this forum. I have to say a big thanks to Mudra in setting this up. Membership is now open though the site will not be fully functional nor promoted til June when I have more time but Mists members get the first chance. Having looked at the poll and talking with a couple of people I decided to incorporate all different membership options into the project. Sign up below if you think its something you can work with. Hi Paul, Your new site looks great. I like the idea of people moving to small communities where they can have their own space (as compared to shared space) yet be close to others who are serving a common goal. Just FYI, I'm currently in Oregon with a foot of snow! We are considering relocating back due to my mother's health as she will never leave this place to come stay with us (unless I hog tie and drug her of course). All of her friends are here and she has been in this location over 30 years. However, here we are a lot closer to Yellowstone so for us it's like moving from one major volcano to another. Here there is only 4 months of growing season, if one is lucky ~ unless one has a greenhouse where in Hawaii it is 12 months. You can guess where I'd rather be. Glad to see you on top of your project. Yep Carol, living with a bunch of hippies like you guys would irritate the crap out of me. I think you have to be very careful in setting up a community as on the ego level there would be too many personality clashes. People like to take over, you know, the human nature thing. If the balance was just right though its worth giving it a go if egos are put to one side. The idea of like minds moving to a town is an excellent one. There are two examples of that I can think of. Glastonbury UK and Salt lake City US. If say 10 members of this forum moved to a town somewhere that would be interesting. Self sufficiency is the key though. There must be some way to grow and produce things that can be shared by the group, whether its 20 naked hippies living in a giant yurt or 45 like minds scattered around a small English town. Looking good Merc. I knew I chose the right people at the start even though I didnt know you guys from Adam. Youve done a lot for these guys . Looking forward to the portal. I will be promoting The Mists portal quite heavily when this site opens properly on the summer solstice next month. Time to draw around the camp fire is it not? Hah! Hippie not. And we've tried having different people in our home from time to time and it rarely works out which is why I like the idea of folks having their own space to create in it what they wish for themselves. Over here in the cold north east area of Oregon we have been burning the firewood daily. However, I thought it interesting that you mentioned Glastonbury as that is the one spot in England I was drawn toward and where it felt like home to me. I could easily live there if it weren't for the coming ice age Paul. I hope you have lots and lots of firewood. South of the equator is warmer. Glastonbury, the heart chakra of earth. should be ok. Dont go along with the ice age thing myself which is why ill be wearing my speedos. Any where above 65 north is good to go ive been told. Southern hemisphere will house the old ways of humanity til they die out. Myself, im no channeler just gut feeling. Way too much geological activity in pacific and west coast of states for my liking. Scotland and scandanavia possibilities.Who knows. I dont. just hunches. best thing to do is get together and be happy. the best safe location probably is in your head! Well... this is great to see. A forum actually working on sustainable community action. I've long thought that discussions on whether there are 56 levels of angels or 59 are pointless. And much forum debate seems to run along these lines. Along with the Discussion of non-provable information and bed-time stories. So it's really heartening Floyd and Mercuriel to see you actually working on this. I agree, forums are not the future, but communities are. I even started a 'pledge' thread on AV2 because I think it is now coming the time for actions (however small) rather than discussions. As a race, we don't want to be like the resistance committee in the Life of Brian, now, do we? Thanks for this. Look forward to reading some of this material. Good to see you swimming in our waters . Good to see you too ! I don't really want to spend my time on forums anymore.. not regarding info anyway on a hundred ways to end the earth... but communities.. that is more interesting. You may want to join Floyd's New Earth Pioneers. That's what it's all about . kulapops wrote: Well... this is great to see. A forum actually working on sustainable community action. The idea was to form a stake holder community to start an actual community but that was not popular as people are not ready to comit to anything and that is entirely up to them. So what I have is an educational site featuring spiritual and eco communities from around the world who will hopefully be sharing their videos, articles, photos and skills with us as well as acting as a hub for self sufficient communities. The place is a bit of a hotch potch at the moment but I have registered a .com name (named after a suggestion by Mudra) and will be upgrading the site towards the end of the month, adding features and putting it all in one place. Communities have responded very warmly to it, especially Findhorn though I await material from most of them. I will start to advertise the site soon to raise its profile. Eventually I will be asking members here if they would like to relocate to the Avalon/Glastonbury area to form our own community. This may be best done by interested people moving to rented accomodation in close proximity to each other rather than an actual community as there are problems with money and land for the latter option. Flat/share could be a possibility. If any one is interested in setting up their own then they should contact me and I will promote and assist them in any way I can. So yes Kula..its an attempt to take from what we have learned in forums and make them a reality. Here is another community that I have visited locally. They do 'friends' weekends where you can go along and help with your time. It's an amazing place, because it is not just about gardening and cooking, but looking at what contribution you will make for a sustainable world. Personally, I'm a bit too airy-fairy for relocating to Glasto.. though I've been to the festival many times and enjoy the vibe coming out of the ground at the green-fields.. the energy of the town is a little too feisty for me... it's like Totnes with teeth... all those skulls, and swords and candles... Still, I think all communities should be supported and it would be great to visit if you get something going, or even visit to help when you're setting up. That's what we all need right now... real help with each other...in any shape or form. kulapops wrote: Here is another community that I have visited locally. They do 'friends' weekends where you can go along and help with your time. Thanks, Ill check out the site.